Immerse yourself in the city that never sleeps during your stay at Courtyard New York Manhattan/Chelsea. 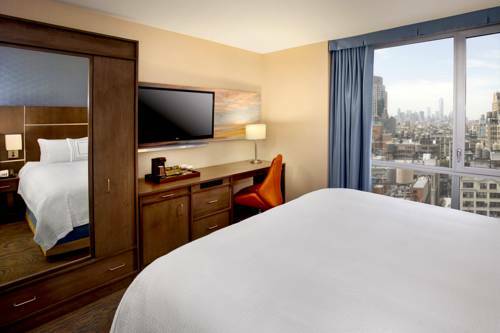 Our stylish rooms and suites reflect the vibrancy of the city with bold pops of color while offering respite from the constant hustle and bustle. Comfortable beds with cotton-rich linens are available when you do choose to slumber, and wall-mounted 42-inch TVs and free high-speed Wi-Fi will keep you well-entertained and connected during downtime. Swing by Table 135 each morning for a healthy and hearty breakfast paired with a Starbucks beverage. Nearby Dewey's Pub serves lunch and dinner for 10% off when you present your room key. Our fully equipped fitness center will help you maintain your exercise routine with modern cardio equipment and free weights. While in the city, be sure to visit the scenic High Line and lively Chelsea Market. We are also near Madison Square Garden and Penn Station. Play as hard as you work when your reserve one night or an extended getaway at our New York City hotel. Enjoy hearty breakfast favorites and beverages created with Starbucks Coffee from this new restaurant near Penn Station; open daily for breakfast until 11:30am. If you're seeking Grab-n-Go morning favorites, this is the place for you. Relaxed sports bar & grill featuring American eats and a large beverage list. Restaurant is connected to our hotel with access from the lobby. Present your room key and receive 10% off your order.